This week on the Tour of the Big XII is University of Colorado. I know, they may be leaving the conference soon, but they're still in it now! The Aggies play Florida International or something. It's not on tv. Shocking. At least the Cowboys game is on...oh wait...it's blacked out for the Titans game. Whatev. Looks like we will be packing up the fam and heading to our local wing establishment to try to see at least some of it. 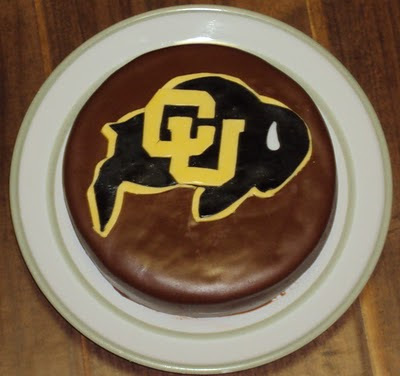 The CU cake looks awesome. We are CU fans by default since we live in Boulder and to be a public fan of any other team would cause a real problem and leave you with no friends! =) Oh and I did got to CU for graduate school!